Make your floor more durable, versatile, and attractive when you shop at our flooring store. 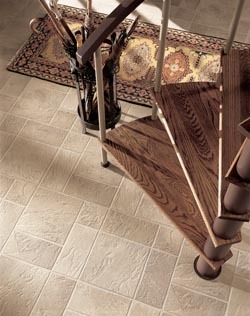 While we offer many different flooring materials, one that attracts many customers is our vinyl flooring. Although it has always been lauded as one of the most cost-effective options, vinyl of days past hasn’t been the most beautiful or reliable. But that has all changed in just the past decade or so. With advances in technology, vinyl tile flooring has because more beautiful, sturdier, and easier to maintain than ever before. In fact, it’s one of the most versatile flooring products on the market. At our showroom, we not only offer you premier vinyl sheet flooring and other high-quality products, we also provide the services that maximize the value of whatever floors you purchase. Our goal is to ensure your complete satisfaction. That’s why our team of professionals guides you through thewill process from selection to installation. We pay attention to your goals for your space and match you to floors based on your needs, preferences, lifestyle, and budget. Once you have your options narrowed down to a few products, our designers can show you what each choice would look like in your home. This allows you to see if a particular product is too dark, too light, too simple, too busy, or just right. This way, you can have absolute confidence that your final decision is the right one. Our vinyl flooring installation team then takes over to ensure maximum beauty and durability of your new floors. Whether you want to impress guests and clients that walk into your business, or you want to give your home a refreshing new look, we have the flooring you’re looking for. Just visit our spacious showroom to discover the perfect vinyl flooring for your property. Vinyl has become one of our most popular choices, not just because of its affordability, but because of the large list of other advantages it offers. Because of modern manufacturing processes, the versatility of vinyl tile and vinyl plank flooring is incredible. There is a wide range of colors, patterns, and textures available that mimic tile, hardwood, and other hard-surface floors. One thing many customers love about vinyl flooring is the slight cushion it has. It’s a hard surface but has a little give to it that makes it ideal for rooms in which people are on their feet for a long time, such as the kitchen. This slight give also makes vinyl more resilient than other types of floors because it won’t crack or warp under heat or moisture. In fact, it has protective wear layers that make it highly resistant to moisture. Overall, the resilience of vinyl tile flooring makes it perfect for families with young children or pets. How do you know you’re going to get the floors of your dreams when you shop with us? The answer is simple—because we take the time to ensure you’re getting something that meets your needs and matches your personal style. Our sales professionals work with you to guide you through our immense inventory and show you samples based on your preferences. Once you have a few options you like, you can see what they’ll look like in your home before you make your final choice. And with our vinyl flooring installation professionals, you can easily complete the entire process and end up with stunning results. To ensure you absolutely love your new floors, we provide you with our Ultimate Confidence Guarantee. By selecting one of our 4-Star or 5-Star rated vinyl flooring products, you get 30 days from the date of purchase to try it out in your home or business. If you aren’t completely satisfied with it, let us know and we’ll replace it—and we’ll even pay for the labor costs. Get the look of hardwood in any room of your home. While solid wood floors are a great choice for many homeowners, they are limited when it comes to their use in rooms like bathrooms and kitchens. But that’s where our selection of vinyl plank flooring comes in. With different colors and patterns, vinyl can mimic virtually any species of wood you would purchase for your home’s flooring. However, because of its wear layers, it’s extremely moisture-resistant, making it perfect for rooms where real hardwood wouldn’t be able to hold up as well. Your floors are important, so why skimp on the installation? When you visit our flooring store, you get all the services you need to complete your project, including professional installation. No project is too big or too small for our contractors, and we bring our excellent attention to detail to every job. When it comes to vinyl flooring, the high quality of the product can only get you so far—you also have to have quality installation to maximize its beauty and performance lifespan. Because we are part of a national franchise, we have the resources to hire and train some of the best installation contractors in the business. Our professional installers care about providing the ultimate in customer satisfaction. We also offer our Lifetime Installation Guarantee, which ensures that you won’t have to pay for repairs on your floors if there is ever an installation-related issue—we’ll take care of it for you. Contact us to reach our flooring store today for more information about our luxury vinyl tile options. We proudly serve the flooring needs of Turlock, Ceres, Hughson, Modesto, and Newman, and all of Stanislaus County, California.